And near a thousand tables pined, and wanted food. Thousands of years ago, we humans formed a covenant with our companion animals. We wanted them to live with us and to share our lives. Because of this our 'pets' lost most of their natural skills to fend for themselves. It then became our responsibility to feed and care for them. While the animals have kept their end of the bargain, we humans largely have not. At PetRescue.Com we are trying, in our small way, to make amends. We believe that all animals deserve to be treated humanely and with respect. Each and every one of us can make a difference and help to keep our ancient promise to the animals. Copyright (c) 1996-2018, PetRescue.Com. All rights reserved. 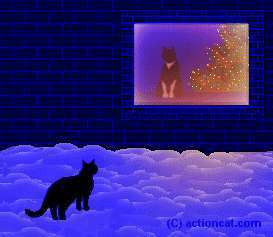 Snow Scene Copyright (c) 1999, actioncat.com. All rights reserved.